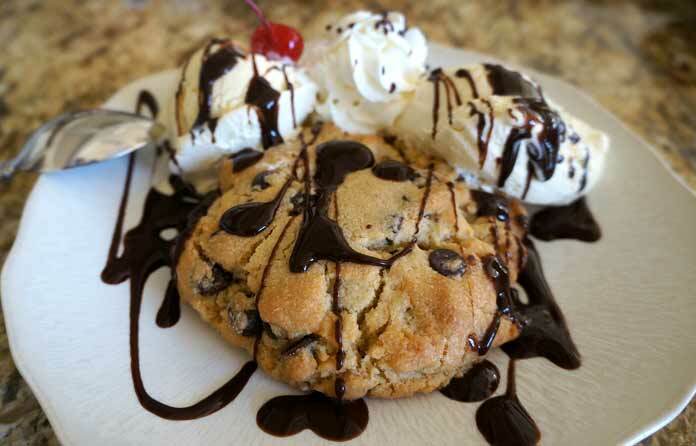 Start with Carol’s Cookies signature chocolate chip cookie without nuts. Make sure you defrost the cookie to room temperature. Warm the cookie in your microwave for 30 seconds. Flip the cookie over and microwave it for another 10 seconds. Place the warm Carol’s Cookie in a serving bowl. Take a scoop of (Homer’s) Vanilla Bean ice cream and place it over the warm cookie in your bowl. Add whipped cream, chocolate or caramel sauce, sprinkles and additional toppings of your choice to the top (nuts optional).